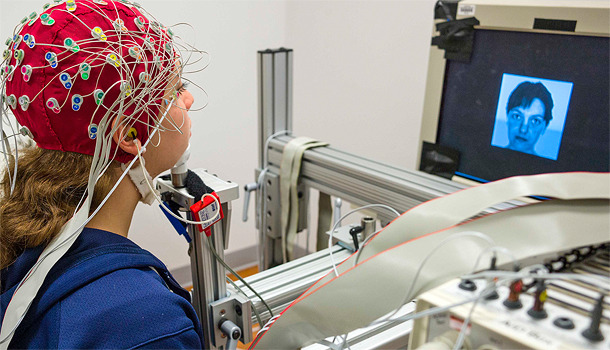 Adam Gazzaley and researchers at the UCSF Neuroscience Imaging Center use EEG, MRI and other non-invasive tools to study cognitive processes while people try their best on drills that test short-term memory. He calls this a deficit in “top-down modulation” — the ability of the conscious part of the brain to direct the visual part to return to duty. It’s the stickiness that interferes with short-term memory. Gazzaley’s UCSF lab and others have found that by training on attention tests, people young and old can improve their brain performance and multitasking skills. His research shows that the benefits may spread to other crucial brain functions such as sustained attention. Commercial “brain training” games have been on the market for more than a decade. Most rely on evidence that the drills work, at least for short-term improvement in working memory. But they don’t draw on the kinds of brain studies carried out in the UCSF lab. Recently, Gazzaley applied his brain physiology studies to the real world of video games. He worked with professional video game developers at a start-up company called Akili Interactive Labs to create an engaging game that draws on his lab’s research. Gazzaley developed the predecessor to the soon-to-be-released commercial game, “Neuroracer.” In his prototype, players have to detect a target sign while driving a virtual car in a 3-D environment. The game can be used both for diagnosis and training. On the diagnostic side, preliminary results suggest that multitasking skills don’t just crash at a certain age, but may actually decline at a steady rate starting early in adulthood. The training results also show that older adults can dramatically improve their ability to multitask. In 2011, Gazzaley filed a patent with UCSF that covers the use of the games for both diagnosis and training brain performance in the domains of distraction and multitasking. Gazzaley’s findings have caught the attention of colleagues who work with autistic and seriously depressed patients. Some clinicians think that engaging patients in these games can improve their ability to concentrate. See video with Adam Gazzaley: Is there a fix for memory impaired distraction?